Glade Creek Glade Creek Grist Mill Babcock State Park New River Gorge National River West Virginia I know. I know. 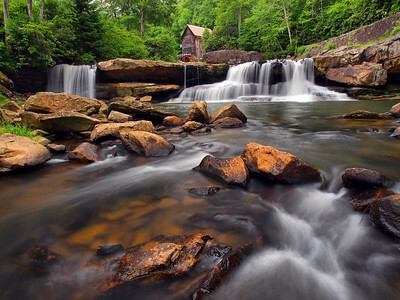 Everybody and their aunt has a photograph of the Glade Creek Grist Mill in West Virginia’s Babcock State Park, but being that I’ve shot here once and that was way back in 2009, I was really wanting to spend some time with this beautiful scenic structure. We had spent the morning shooting at Mill Creek and eventually harsh sunlight ran us off. We were a bit surprised because our weather app was saying there was an 85% cloud cover and there was barely a cloud in the sky. After some discussion we decided to head over to Babcock to see if there was better conditions. As soon as we topped out on US 60 it was quite apparent we were sitting under the only hole in the cloud shelf and as we made our way to the park we found ourselves back under a blanket of even light. 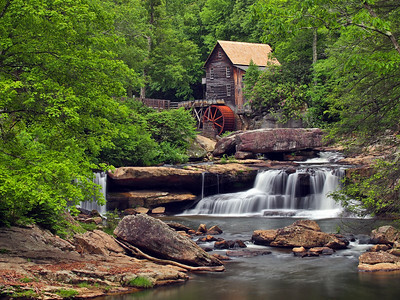 Constructed in 1976 of pieces of 3 mills which were located across the state of West Virginia, the Glade Creek Grist Mill it is fully operational and is a recreation of Cooper Mill which stood nearby many, many years ago. For those of you who don’t know about the popularity of this place, in the fall, a line of photographers 5 deep will line up along the road downstream from the mill to capture their own iconic image of it. On this day we visited on a Friday and there weren’t many folks around, which is nice. From my understanding weekends can be ridiculous and if you’re a photographer wanting get some shots without any people in it, it can be quite the challenge. Lucky for us it was Friday and only a handful of folks had been through over the couple hours we spent here. I got a lot of shots here I really do enjoy so this won’t be the last shot of this place you’ll see from me. Glade Creek Glade Creek Grist Mill Babcock State Park New River Gorge National River West Virginia Back in June of 2016 I got to spend some quality time at the Glade Creek Grist Mill in West Virginia's Babcock State Park. Although I've been here a couple of times in the past I really didn't get to soak in the beauty of this scenic area. Of course I hit the traditional viewpoints but I thought I would get down in the creek and check out some perspectives I don't normally see. I ended up spending quite some time shooting the falls as the main subject and this one turned out to be one of my favorites. Wow, what a beautiful place to spend an afternoon with some good friends! Glade Creek Glade Creek Grist Mill Babcock State Park New River Gorge National River West Virginia Back in June 2016 myself and my good friends The Static Brothers spent a few days in West Virginia's New River Gorge. 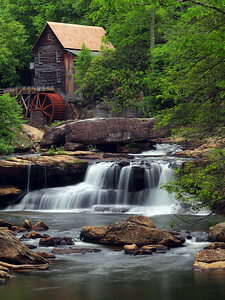 One place that was on my list to visit was The Glade Creek Grist Mill. Located in Babcock State Park the mill is constructed of 3 other deconstructed mills from across the state and is an extremely popular destination, especially in the fall. I highly doubt I'll ever visit the mill in the fall but I was satisfied to visit in the spring as the rhododendrons were blooming in front of it. Certainly one of the states most iconic and beautiful scenes! 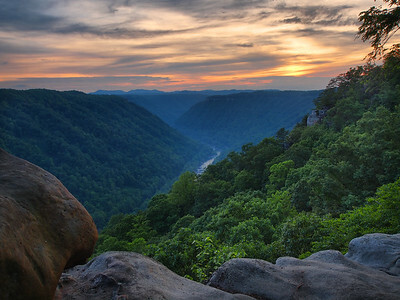 Beauty Mountain New River Gorge National River West Virginia It's always fun to end your day with good friends and what better a place to do that than Beauty Mountain for a New River Gorge sunset! Lined up along the cliff side waiting for the last show of the day, we enjoyed a few laughs and tried not to crowd one another too much. It took me a while to settle in, the spot I chose had a tree that had fallen and was completely disrupting the foreground, more so that I had first anticipated. By the looks of the situation I felt I could push the tree off the rock in a crack between two boulders out of sight, however after breaking off some decent sized limbs and tossing them over the cliff (which gave me some concerned looks) it became pretty evident that I wasn't going to effect the position of that tree at all. So, I just hopped up on the rock next to me, settled in and enjoyed the show. Although it was pretty blustery, so far this is my favorite sunset I've got to witness here. Beauty Mountain New River Gorge National River West Virginia I've didn't realize it until recently when I was going through my archives for this website but I've been to Beauty Mountain umpteen times over the years and oddly I've only posted a few photographs from this gorgeous New River Gorge overlook. We joke about it a lot, that I am a sunset killer and far more often than not, a sunset won't pan out if I'm shooting it. There's been a lot of idle time waiting for "that moment" here. On this most recent trip to West Virginia we rode in knowing we were going to make there in time for sunset and as we drove 64/77 after we passed through Charleston we began hitting several small storm cells. My good friend Bryan Janosick and I started getting pretty excited as, in most cases, late afternoon storms usually lead to a great sunset. We drove in rain until we made it to Fayetteville and as we crossed the New River Gorge Bridge the skies gave the impression that tonight we were in for a spectacle, and to top it off, there was fog over The New River. Once we reached the parking area for Beauty Mountain we hurried out to the cliff line and met up with our good friend Randy Sanger and his faithful four legged companion Rocky. As we had hoped, the fog had filled the gorge but after examining the horizon it became apparent it was going to be a cataract sunset. Even though we knew this wasn't going to be that epic event we had thought it might be we went ahead and shot anyway. Tonight is the first night I've actually looked at the photos from that evening, and I surely am and glad I did. 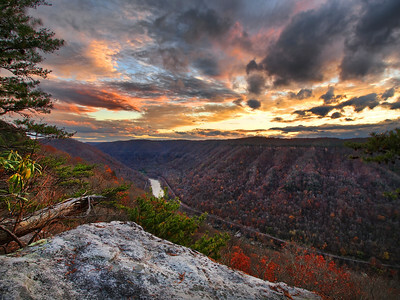 Beauty Mountain New River Gorge National River West Virginia Here's another shot of sunset at West Virginia's Beauty Mountain in the New River Gorge. My good friend Bryan Janosick and I showed up late to this show after mulling around the upper waterfalls of Marr Branch close to sunset. We made a hurried b-line and we were expecting a show because as we crossed the New River Gorge Bridge the light was looking sweet. But as we made the 15 minute rush trip to the overlook parking it was becoming apparent that things weren't going to be what we had hoped. This is another one of those, "Oh, what can it hurt" shots as I had no hope of it turning out, but I was wrong. After just recently looking at this image for the first time I found I really liked the pastel light in the sky and the greens and blues in the gorge below. Beauty Mountain indeed! Big Branch #2 Big Branch New River Gorge National River For years now I've been riding past Big Branch on River Rd. with my good friend Randy Sanger on our way to Sandstone Falls in West Virginia's New River Gorge, and every time he mentions how I need to see the the falls on that creek, but the time of the year I visit it's always dry. 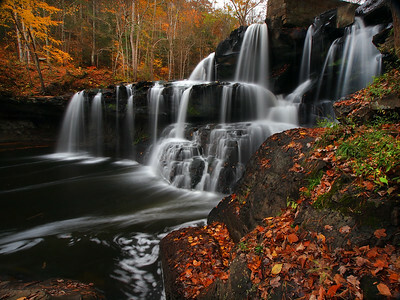 The pictures I've seen of the many falls on this stream have been stunning so we planned a trip in the Spring. As luck would have it, it would be somewhat a dry spring with long periods of time between days of significant rainfall and again the low waterflow made visiting the falls not worth the time. However, on our last day of shooting it finally rained, just enough to get the falls flowing, so that evening we headed into the watershed. The canopy was amazing, it was very dark making for very long exposures and the falls were just gorgeous. This is Big Branch #2, it's not a very tall falls, but that doesn't matter, what it lacks in height it makes up for it in personality. 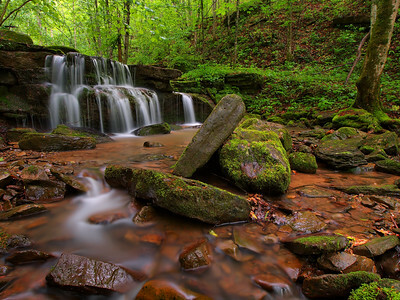 I loved the moss covered rocks here. Sadly as the sun set I only had the time to visit 3 of the 5 falls on the creek, but mark my word, I'm watching the weather and if the opportunity presents itself I'm going to take a day and drive the 5 hours and spend some quality time in this side of paradise. 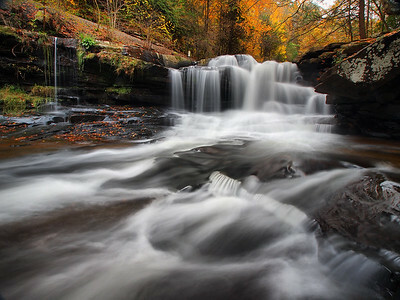 Brush Creek Falls Brush Creek Brush Creek State Park West Virginia This past November myself and The Static Brothers stopped by here as some patchy cloud cover moved in. Oddly this shot almost didn't happen when everyone else from the group headed on down and I decided to catch a cat nap in the car with the windows down and Muddy Waters on the stereo. Well, 45 minutes later I woke up. What a bad idea that was. I felt terribly groggy but decided to get up anyway and hike the trail down to the falls. After wobbling nearly the whole way there (thank goodness for trekking poles) I finally made it to the base of the falls. Of course then the sun decided to pop out. If it had of been a full on cloudy day I'd of hung out in front of the falls for a while but I do love me some side falls so I rock hopped the creek and made my way up the other side. As the sun popped in and out I noticed that the water was mostly unaffected by the harsh light from this side angle and in fact I really liked the effect of that the sun was having on the surrounding landscape. Although some compositions I had been planning to try out were completely out of the question, I had some other ideas that seemed to work out fine. This turned out to be one of my favorites. 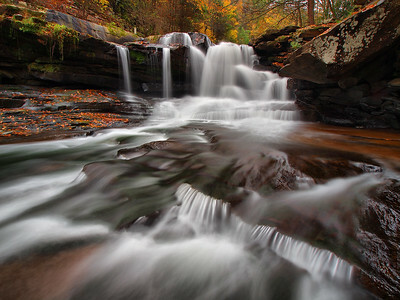 Brush Creek Falls Brush Creek Brush Creek State Park West Virginia I don't think we could have asked for better shooting conditions on our first day of our October 2012 West Virginia trip. Our second stop of the day was Brush Creek Falls, an impressive and beautiful waterfall located about 20 miles from Sandstone Falls in the New River Gorge. Although gorgeous, the falls is a difficult subject to shoot from below as a massive splash pool makes for an uninteresting foreground. From the right side though it is a completely different story as not only can you get up close and personal with this lovely waterfall but you can get lost in it's personality and beauty. 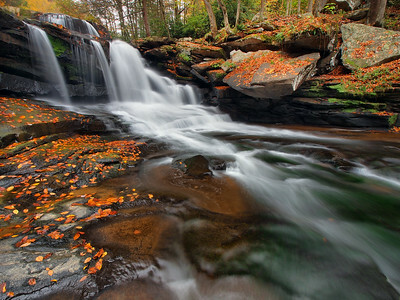 Brush Creek Falls Brush Creek Brush Creek State Park West Virginia The last time I paid this falls a visit in the fall of 2011, I never even thought of shooting it from the right side, but a couple weeks after that visit my good friend Randy Sanger posted a shot from that side and I said to myself, "why didn't I think of that?!" I couldn't wait to go back and almost exactly 1 year to the day I did. 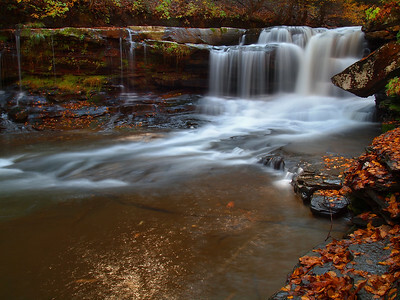 Brush Creek Falls, although beautiful, is a difficult falls to shoot from the left side or directly in front because of the large splash pool, but from the right there are multiple compositions and to me the beauty of this falls really shines from this perspective. This was a truly great day as I not only got to hang out with some wonderful friends but I got to meet a few folks in person after being Flickr friends for some time. Good times! 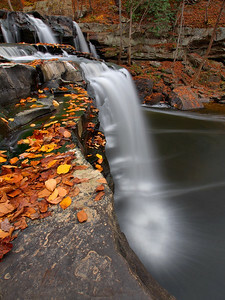 Brush Creek Falls Brush Creek Brush Creek State Park West Virginia Although I'm not a fan of shooting this falls from the left side at ground level, I am a fan of shooting it from the left side along the shelf. 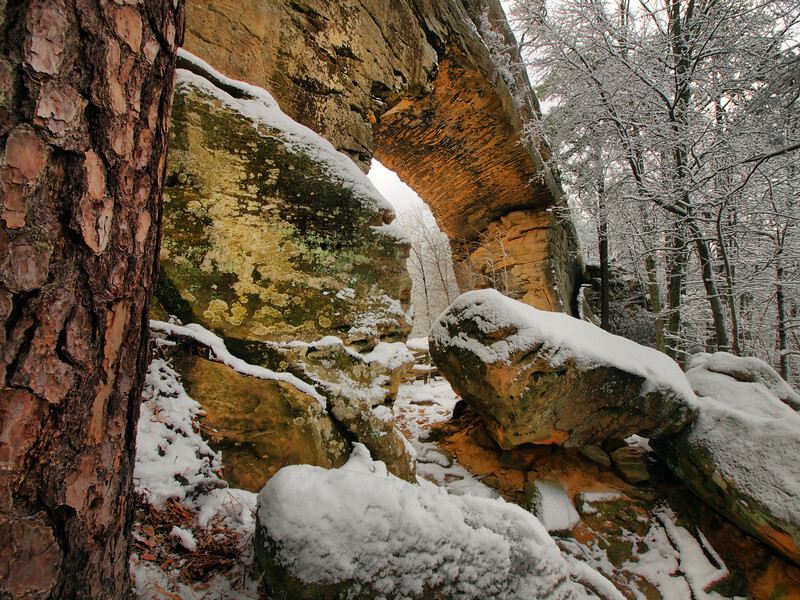 It offers an interesting perspective and helps show the arc that the falls creates as it makes it's descent. 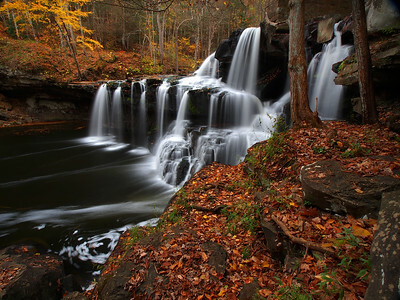 Definitely a one of the more beautiful falls in the state. 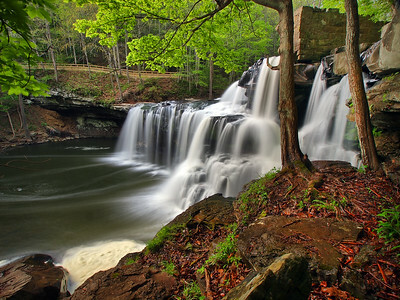 Brush Creek Falls Brush Creek Brush Creek State Park West Virginia West Virginia is loaded with waterfalls and one of my favorites is Brush Creek Falls! Located in the southern section of the state, almost a stones throw from I-77, you can't help to be impressed with it's size when you first lay eyes on it. 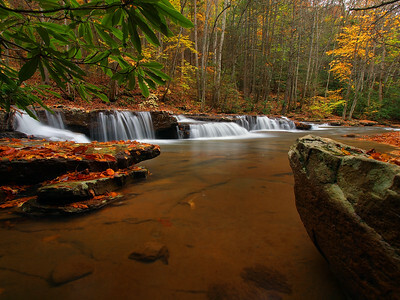 Although there's numerous perspectives to view the falls, mine is to cross the creek and view it from here. 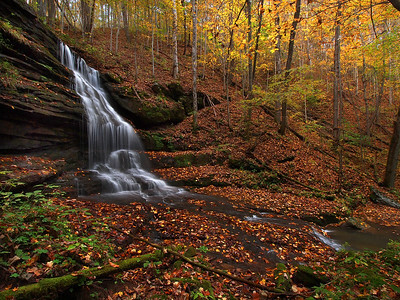 Such a cool place to relax and soak in the beauty of this magnificent waterfall! 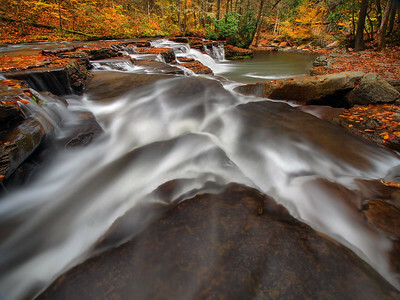 Campbell Falls Camp Creek Camp Creek State Park West Virginia On this visit to Campbell Falls in October 2014 to Camp Creek State Park in Southern West Virginia I thought I would try some new and different comps. This was the most water I'd ever seen here and we spent quite a while drifting all over shooting. I played a lot around this section of the falls, I rarely shoot one downstream but in my opinion if you don't try new things you become a bit stale. Campbell Falls Camp Creek Camp Creek State Park West Virginia Normally us waterfallers like cloudy days and this day was no exception, but with the whole trip calling for full on sun we thought we'd go and shoot anyway. As we were shooting the falls the sun set behind the mountainside and what happened before our eyes was one of the most spectacular displays of color I've ever seen. Illuminating the leaves behind the falls the light reflected into the water below creating a scene that was truly awe inspiring. A great time with great friends I must say and I got to meet some new ones here as well! Campbell Falls Camp Creek Camp Creek State Park West Virginia While shooting with my good friends Randy Sanger, Todd Williams, Sarah Hampton and Jason Haley, it was a bright sunshiney day when we decided to head up to Campbell Falls in Camp Creek State Park in West Virginia, we spent quite a while there shooting in the direct sunlight, but as the sun dipped behind the mountain something unique happened as one of the most beautiful scenes I've ever seen unfolded before our eyes. The sun illuminated the colorful trees behind the falls creating an incredible reflection of bright colors in the splash pool, truly one of my favorite moments as a photographer. Campbell Falls Camp Creek Camp Creek State Park West Virginia It's not everyday one gets to see a once in a lifetime event, but on this particular day at Campbell Falls at Camp Creek State Park in Southern West Virginia myself and some good friends were treated to a spectacular scene. We had spent quite some time shooting the falls in the late afternoon light and boy, oh boy was I getting hungry. I seriously wanted to leave. But my good friends Randy Sanger and Todd Williams insisted we stay as the direct sunlight would be off the falls in a short time. 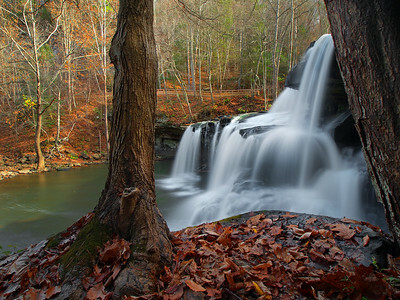 Reluctantly, I chose not to push the issue further and shoot the falls in the impending shade. 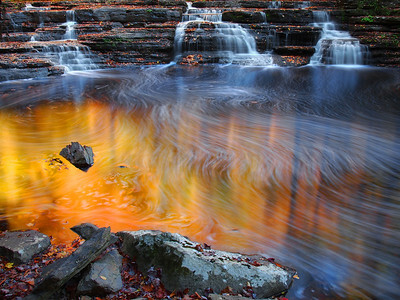 What a decision that turned out to be, as the sun set behind the mountain and shaded the splashpool and shortly there after the waterfall, an amazing array of color exploded on the water as the sun lit up the orange colored trees over the falls creating a vibrant reflection! 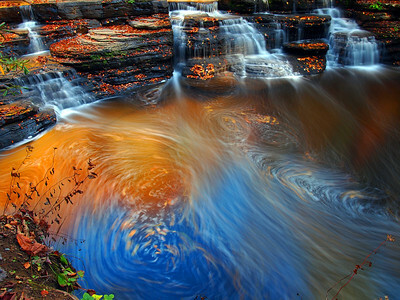 Combine that with swirling leaves and foam it was truly a sight to see! Good think I let my friends win out over hunger! Upper Falls Campbell Creek Camp Creek State Park West Virginia When it comes to Camp Creek State Park in Southern West Virginia two falls get a lot of attention; Campbell Falls and Mash Fork Falls, however there is a third lesser known falls upstream from Campbell Falls. This was the first time I'd visited this falls, in the past there wasn't enough water or I had run out of light but on this trip there was plenty of both. Although not very tall, 4 feet or so, it's still lovely as it stretches the entire length of the creek and there's plenty of perspectives to shoot and enjoy it, even more if you don't mind getting your feet wet. Just another of the many surprises that the beautiful state of West Virginia has to offer. Dunloup Falls Dunloup Creek New River Gorge National River West Virginia I've visited this falls on Dunloup Creek many times over the years and every time I always shot it from the bank but this visit I planned on doing something different. So when we got to the falls I put on my Traxx Ice Walkers and out into the creek I walked setting up smack dab in the middle of the creek. It's so cool to be there in the rushing water, I love to take a moment and focus on one spot, it gives the optical illusion you're flowing downstream. Dunloup Falls Dunloup Creek New River Gorge National River West Virginia One of my favorite West Virginia waterfalls to visit is the Falls On Dunloup Creek, even though everyone and their Grandma has a photograph of the falls it really doesn't matter, it's a beautiful falls and always worth some time. This time I said I was going to cross the creek and get the falls from the other side and I did, but the shots I got crossing the creek turned out to be my favorites from this visit. Dunloup Creek Falls Dunloup Creek New River Gorge National River West Virginia All weekend during a trip to West Virginia's New River Gorge in October 2011 we fought difficult lighting conditions, but imagine my surprise when on our way to the ghost town of Thurmond that the morning light had yet to hit the falls on Dunloup Creek. I had visited this falls in May of 2009 with friends Jason Haley and Randy Sanger and sadly I walked away with some poor photographic representations. 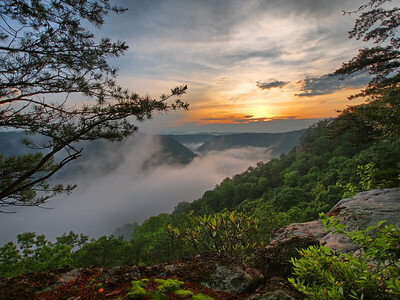 Back then, Jason and I were on our way home from a trip across the entire length of the Blue Ridge Parkway and had contacted Randy prior to the trip knowing we'd be passing by the New River Gorge. Jason and I were only in the area for a few hours as Randy gave us the expedited tour, but I knew by the little bit I saw I wanted to come back. So here I was again, with Jason and Randy, good friend Bryan Janosick and new friends Todd Williams and Sarah Hampton taking in the beauty the New River Gorge has to offer. 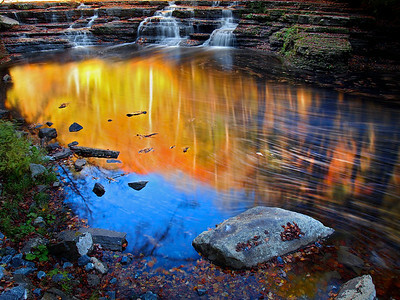 Everybody and their aunt may have a photograph of this gorgeous falls, but at least now I have a good one.